They contain no waxes or thickeners, (no manufacturing shortcuts). The colour palette includes the best original natural earths and true cadmium pigments. Average pigment concentration is very high. Formulas are perfected to balance the drying times of all colours. Bright, lively colours with overall harmony in the palette, Classico colours are made with modern non-toxic, non-polluting pigments that improve lightfastness. All colours may be intermixed together in any ratio or proportion, without limits. All this thanks to Maimeri’s vast experience, summed up in an oil line that has proven to be so successful it has become the daily workhorse of a whole generation of artists. 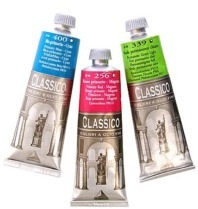 Classico studio tubes are 60ml. For 200ml tubes click here. All Classico Oil are 10.49ea.